Deliveree, known as Transportify in the Philippines, has partnered with BAIC Philippines to endorse the BAIC H5 for prioritized accreditation and onboarding to the Transportify Partner Fleet. Transportify is a marketplace that connects delivery vehicles to businesses that require delivery of goods in commercial quantities. Currently, delivery vans in Transportify’s FB/Van vehicle class are the most popular vehicle on the Transportify platform for bulk delivery service and they can earn approximately 72,000php per month (assuming 22 days working) which is already net of the platform’s 20% commission. Despite these potential earnings, demand for these delivery vans still greatly outpaces supply. With the consistent rise of the Philippine economy, faster than most in Southeast Asia, logistics is one of the industries that would immediately benefit from this growth. More delivery vehicles are needed to ensure fully-stocked retail outlet and restaurant bodegas all over the country, especially during the Christmas season. Focusing more on the urban setting as Transportfiy is still an intra-city operation in Mega Manila (including many parts of Cavite, Laguna, Rizal, Bulacan), the requirement for delivery vehicles inside urban and semi-urban areas is greater for smaller delivery vehicles. Specifically, there has been increased demand for delivery vans with a similar configuration to the iconic L300FB. This increased demand for smaller delivery vehicles is driven primarily by two factors; (1) evolving retail formats to smaller stores and (2) local city ordinances that limit the utilization of larger trucks, more popularly known as the “truck-ban”. 1) Value for Money – At around 700k-800k peso range the H5 is the best value for money. Compared to its peers in its affordable 700k-800k price range, the H5 is already Euro4 compliant and performs exceptionally well, having good power combined with smooth handling. Its FB-body configuration also can hold more cargo or passengers than other comparable light commercial vehicles. Other models that boast excellent specifications are at the 900k – 1.2M peso price range. Our team has compared and test-driven the H5 and have been very content with the experience. 2) Euro4 Compliance– as of this writing, the BAIC H5 is the only Euro4 compliant in its peer group. All new vehicle registrations of similar FB-type vehicles have to be Euro4 compliant beginning January 2018 as per Republic Act No. 8749, otherwise known as the Philippine Clean Air Act. Any vehicle that is not Euro4 compliant will be soon be obsolete and future maintenance will be a challenge. We also expect prices for the any new Euro4 versions released by other auto groups to increase. Kudos to BAIC for being first. 3) Support – BAIC is an established global brand headquartered in Beijing and the Turin Styling Center in Italy. It is one of the largest automotive manufacturing groups in China. BAIC Philippines is owned and operated by Universal Motors Corp. (UMC), the former Philippine distributor of Nissan. The H5 is accredited by Transportify and can immediately be onboarded to the platform categorized in the “L300/Van” class of delivery vehicles. Transportify will also guide onboarded H5 owners through the requirements and process of acquiring a Provisional Authority (PA) and Truck-for-Hire certificate of public convenience (CPC). 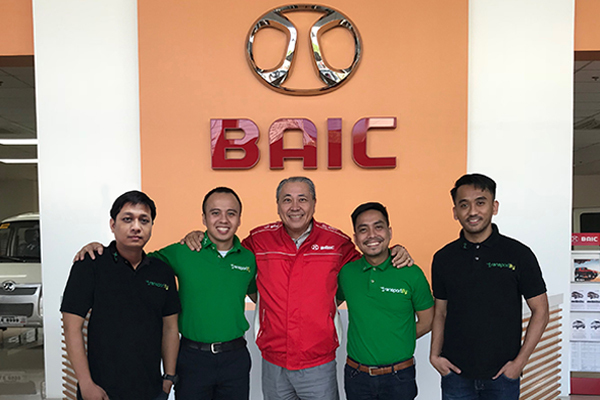 Transportify Philippines is glad to announce its successful partnership with Bayan Automotive Industries Corporation (BAIC) in endorsing the BAIC H5 Bayanihan, which is believed to satisfy the economy’s needs with H5 Bayanihan’s value for money, Euro4 compliance, and global support due to BAIC’s branding.